Shopping for a new Hyundai Elantra? The 2019 Hyundai Elantra sedan has a new look, but we’d still put our money on the more practical Elantra GT hatchback. An edgy new look should help the 2019 Hyundai Elantra stand out in the compact car melange. That’s as long as shoppers can resist the temptation of high-riding crossover SUVs such as Hyundai’s own Tucson. The Elantra sedan and Elantra hatchback share a name, but they’re distinctly different vehicles. Elantra sedans are available in SE, SEL, Value Edition, Limited, Eco, and Sport trims, while the GT comes in base and Sport trims. This review covers the gamut, but our score is based on the more popular Elantra sedan. 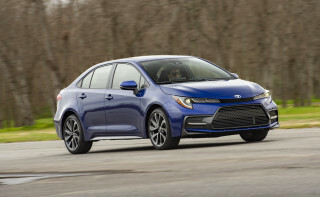 For 2019, the four-door has a new front end with sharp headlights that dig into its grille. A curvy hood adds to its appeal. Hatchbacks carry on with a jelly bean shape that doesn’t look quite as good, but we hope an update is on its way. The sedan may be the most popular and the best looking, but following the crowd isn’t always the best choice. Proof: the Elantra GT, with its spacious interior, upscale trim, and handling prowess. The Elantra GT has good room for four adults and a nice enough interior, but the GT benefits from the European market’s tendency toward upscale hatchbacks. The Elantra GT also follows the European tradition of sharp handling and a firm, but absorbent ride. By contrast, the Elantra sedan has lighter steering and a softer ride in most configurations, which may make it more desirable for buyers who prioritize comfort. Underhood, the majority of Elantras use a 2.0-liter inline-4 rated at 147 horsepower in sedan guise and 162 hp in the GT. A 1.4-liter turbo-4 powers the efficiency-oriented Elantra Eco, while a 1.6-liter turbo-4 with 201 hp gives Elantra Sports noticeably more verve. A 6-speed automatic shuttles power to the front wheels in the vast majority of Elantras, although SE sedans and all Sports are fitted with a 6-speed manual as standard. Turbocharged Elantras—Eco and Sport—are available with a 7-speed dual-clutch. 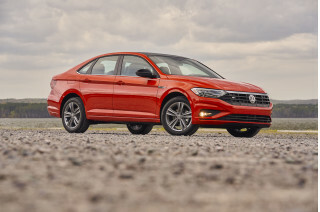 Sedans get sharper headlights for 2019, plus some interior revisions. Active safety tech such as automatic emergency braking and adaptive cruise control now comes standard on all sedans but the Elantra SE. Not every facelift is successful. One winner is definitely the 2019 Hyundai Elantra. 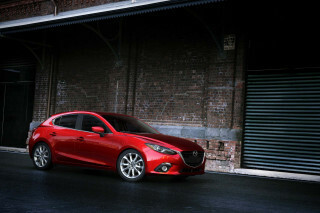 Its bold, sharp headlights dig deep into its grille for a look that stands out among compact sedans. Up front, Elantra Eco, Limited, and Sport trims feature standard LED running lights that, when off, appear as a mirrored surface. The lights themselves cut well into a grille that’s pleasantly light on chrome. More curvature to the Elantra’s hood than most compact cars gives it an Audi-like muscularity. From the side, the belt line that whips up into the rearmost roof pillar doesn’t work quite as well. We’re less enthusiastic about the 2019 Elantra GT hatchback, which now looks like yesterday’s news. Its headlights are separated far from a low, wide grille. 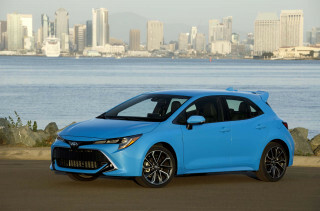 Inside, the sedan and hatchback share some shapes but are notably different cars. In the sedan, the touchscreen for infotainment—5.0-inch on SE, 7.0- and 8.0-inch otherwise—is well-integrated with the slab of secondary buttons below. Clear climate controls with toggle-style switches sit above a small storage pocket. Elantra GTs put their touchscreens up high, floating tablet-like proud of the dashboard and flanked by buttons and knobs. Sport versions of both have contrasting color accents that dress up what is otherwise a sea of monotone. The 2019 Hyundai Elantra Sport can entertain, but other models are just average to drive. Most Elantra sedans—SE, SEL, Value Edition, and Limited—use a 2.0-liter inline-4 rated at a relatively weak 147 horsepower and 132 pound-feet of torque. Elantra SEs come with a 6-speed manual transmission. A 6-speed automatic is optional on the SE and standard elsewhere. This base engine is reasonably refined, but its automatic transmission is designed to upshift quickly to save fuel. Deliberate stabs at the gas pedal are a requirement to extract the most out of the engine in anything more than routine city driving. The Elantra GT has a 162-hp version of the base engine, which provides it with better passing power—especially with passengers aboard. A 1.4-liter turbo-4 paired to either a 6-speed manual or a 7-speed dual-clutch automatic comes under the hood of the Elantra Eco (sedan only). With just 128 hp on tap, it’s not as thrilling as its turbo and transmissions might suggest. The blame here lies with the unusually wide gaps between dual-clutch transmission’s first three gears, which exacerbate its power shortage. Underneath, most Elantras feature MacPherson struts up front and a simple torsion-beam rear axle tuned for a soft ride and easy handling, even with the optional 17-inch alloy wheels. The Elantra’s stiff structure helps these compacts take potholes in stride. The enthusiast’s choice, regardless of bodystyle, is the Elantra GT. 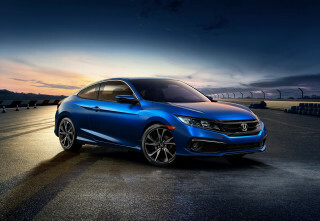 Underhood, a 2.0-liter turbo-4 rated at 201 hp provides motivation to the front wheels via either a 6-speed manual or a retuned version of the Eco’s 7-speed dual-clutch. Elantra Sports also swap in a costlier multi-link rear suspension that provides a better ride and more handling tenacity. They’re on the heavy side for sporty small cars, but they work well on curvy roads. Though the Elantra Sport has larger front brakes than other models, we’ve noticed a wooden pedal feel and noticeable fade in repeated stops. The 2019 Hyundai Elantra doesn’t move the bar for its interior comfort and quality, although it is spacious. A 6-way driver’s seat is standard fare on all Elantras. Most models feature grippy cloth upholstery, while the Elantra Limited subs in decent leather and a power driver’s seat. The front seats are about par for a compact car, and relatively narrow roof pillars deliver good outward vision. Elantra Sports have grippier bucket seats with deeper bolsters up front that offer excellent support, but we recommend trying before buying. Rear-seat riders have 35.7 inches of legroom in sedans and a little less in hatchbacks thanks to their slightly shorter wheelbases. The rear bench is flat for three passengers and low to the ground for good head room for taller riders. Sedans have just 14.4 cubic feet of trunk space, but the hatchback’s tailgate opens to swallow an extra 10 cubes with the rear seats upright and a hefty 55 cubic feet with the rear seats folded flat. Elantra sedans have some soft-touch materials scattered about. Hatchbacks cost more, and for a reason: they have nicer interior materials all around. Crash-test scores are a mixed bag with the 2019 Hyundai Elantra. The major crash-test agencies are in conflict over the Elantra's safety. There’s good news for most Elantras this year. All but the base Elantra SE sedan now come standard with active safety gear including automatic emergency braking, active lane control, and a driver attention monitor. Last year’s model had mixed crash-test results. 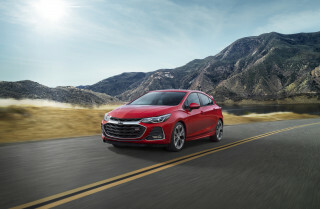 The IIHS awarded Elantra sedans and Elantra GTs with automatic emergency braking and automatic high-beam headlights with Top Safety Pick awards. New headlight designs this year have changed the Elantra’s rating to Top Safety Pick+. The NHTSA gave the Elantra just four stars overall with a special note that “The rear passenger's thoracic and abdominal rib deflections were elevated” in the rear side-impact test. 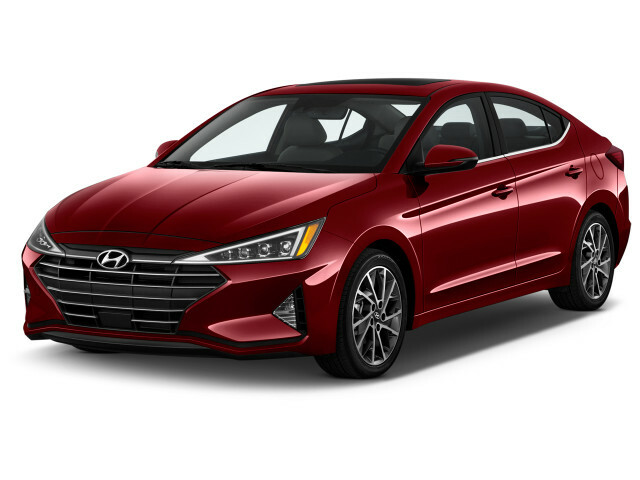 The 2019 Hyundai Elantra runs the gamut from simple to plush to almost sporty. The Elantra SE sedan comes with power features, a 5.0-inch display for its audio system, Bluetooth, and 15-inch steel wheels with hubcaps. A better starting point, as far as we’re concerned, is the Elantra SEL that adds a 7.0-inch touchscreen for infotainment with Apple CarPlay and Android Auto compatibility, alloy wheels, and a full suite of active safety gear including automatic emergency braking, blind-spot monitors, and active lane control. The Elantra Value Edition piles on some niceties including dual-zone automatic climate controls, rear-seat cupholders, heated front seats, keyless ignition, power moonroof, and an app suite for the infotainment system. The Elantra Eco mostly mirrors the SEL, but with an efficiency-oriented turbo-4 under its hood. Stepping up to the Elantra Limited nets LED headlights, leather upholstery, a power driver’s seat, and Infinity speakers. Pedestrian detection for its automatic emergency braking system, a moonroof, an 8.0-inch touchscreen with built-in navigation, and adaptive cruise control are bundled in the Ultimate Package. The Elantra GT more or less builds on the SEL with larger wheels, a sport-tuned suspension, upgraded brakes, and a hatchback body. 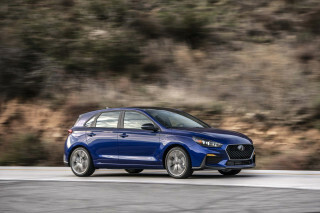 The Sport trim for both Elantra sedans and Elantra GT hatchback adds to the Limited the 2.0-liter turbo-4, and a more sophisticated rear suspension. Hyundai has not announced pricing for the 2019 Elantra, but last year’s fully loaded Limited sedan cost about $28,000 and the GT Sport hatchback was about $29,000. The 2019 Hyundai Elantra delivers good, but not class-leading fuel economy. The most popular Hyundai Elantra models are rated about average for compact sedans. Those figures apply to SEL, Value Edition, and Limited trims that are most popular with consumers. The Elantra SE’s smaller wheels and lower rolling resistance tires earn it 29/38/33 mpg, a modest improvement. Sticking with the stick-shift doesn’t save any fuel on the Elantra SE, though. It’s rated at 26/36/29 mpg. The Elantra Eco ekes out 32/40/35 mpg, which put it on par with most versions of the Honda Civic. The Elantra GT’s hatchback body doesn’t cheat the wind as well as the sedans; it earns as low as 23/30/26 mpg for the GT Sport manual transmission.